Arbuscular mycorrhizal [AM] fungi are naturally-occurring fungi that are found in most, if not all, soils. They colonize roots of most crop plants to form a mutualistic (beneficial to both partners) symbiosis. Notable among crop plants that do not form this symbiosis are members of the mustard family (eg. rapeseed, broccoli), spinach, and sugar beet. The AM fungi assist plants in the uptake of mineral nutrients from the soil and enhance resistance to disease and drought. The primary benefit to plants is the enhanced uptake of mineral nutrients such as phosphorus, zinc, and copper that are “immobile” in the soil solution; that is, they do not dissolve well in the water in the soil and hence do not move toward roots as plants withdraw water from the soil. In the absence of mycorrhizal fungi, these nutrients can be taken up from a distance of only 1-2 mm away from the root. The thread-like strands (“hyphae”) of the AM fungi that are external to the root extend 8 cm or more away from the root, drastically increasing the volume of soil from which these immobile nutrients can be extracted. Given these benefits, better utilization of the AM symbiosis is attractive to farmers, especially organic farmers who seek to minimize off-farm inputs. Farmers have two options for this: 1) adopt farm management practices that increase the functioning of their native populations of AM fungi or 2) inoculate with AM fungi. Economic and practical constraints make option 1 the likely route for row crop farmers. Vegetable farmers who grow their own seedlings for outplanting to the field can efficiently and economically use inocula of AM fungi. Inoculum of AM fungi are commercially available, but farmers can grow inoculum of the AM fungi indigenous to their farms using a simple and reliable method developed through a collaboration by the USDA and researchers of the Rodale Institute. AM fungi are “obligate symbionts,” meaning they need to colonize a host plant to grow and complete their life cycles. This means that, to produce inoculum of these fungi, one needs to supply access to plants, in particular to living plant roots. Here, we will use bahiagrass (Paspalum notatum) seedlings. Bahiagrass is a good host for AM fungi and is not winter hardy in temperate climates. Therefore it will not become a weed pest in the inoculum. Other Graminaceous species should work as host plant, but one will want to be sure to prohibit seed production. One therefore needs to supply the things the plant will need to grow: nutrients, water, and sunlight. Nutrients are supplied via compost. The media in which the plants are grown, and therefore in which the inoculum is produced, is a mixture of 1:4 (volume basis) of compost and vermiculite. Locate the inoculum production system in full sunlight and water as needed. Lastly, one needs a “starter inoculum.” The original design of this method (see resource no. 1, below) entailed initial production of the bahiagrass seedlings in potting mixture inoculated with individual species of AM fungi. The hope was that after demonstration of the success of the method, commercial sources would make available the “pre-colonized” bahiagrass plants. This did not happen, thus the need to explore another source of starter inoculum. Using field soil from your farm as starter inoculum has two advantages: it is free and the AM fungus community already in your field soil is adapted to your climate and soil conditions. Two ways to incorporate field soil into the inoculum production procedure are 1) to add it to the potting mix in which the bahiagrass seedlings are grown prior to transplant into the inoculum production system or 2) to mix the soil into the compost and vermiculite mixture. These were both studied in earlier work (see resource no. 2, below). Option 1 is unattractive because it requires collecting soil when fields may be frozen. The current project was initiated because inoculum production with Option 2 has been inconsistent. The target date for the setup of the inoculum production system is just after the threat of spring frost has passed in your area (see Figure 1). 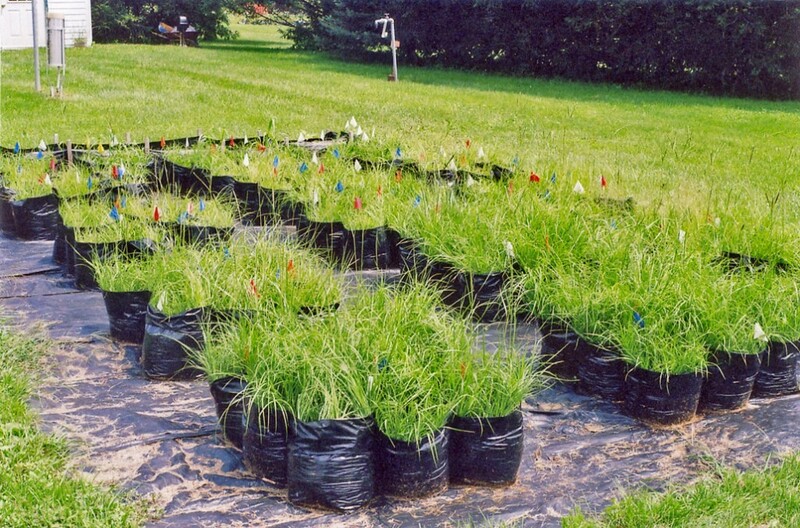 Begin producing your bahiagrass seedlings three months prior to that. They take one week or more to germinate and are initially slow growers. Then, after the threat of frost has passed, fill seven-gallon (26.5 L) plastic bags (“Grow Bags,” Sunleaves Garden Products, Bloomington, IN 47404) two-thirds full with a 1:4 (v/v) mixture of screened (6.4 mm mesh) compost and vermiculite, respectively. Next, mix 200 cm3 (approx. one cup) of sieved field soil (more on that below). Transplant your bahiagrass seedlings into the bags, 5 per bag. Weed and water the bags as needed throughout the growing season (see Figure 2). There will likely be some weed seeds germinating from the compost, and the goal is to remove these winter-hardy plants from the bags. The bahiagrass is then winter-killed, and the bags overwinter in place, outdoors. The following spring, the compost and vermiculite mixtures from bags are harvested and mixed into horticultural potting media (1:9 inoculum:media, volume basis) for use in the greenhouse to produce mycorrhizal vegetable seedlings. There is no easy way to check the level of the population of AM fungi in the soil you have chosen to use as starter inoculum, especially since you are collecting it just prior to use. Therefore, the objective of this experiment was to test soils from a variety of farm habitats as starter inoculum for the on-farm production of inoculum of AM fungi with the goal of making a general recommendation of where to collect soil on your farm. 8‑10 samples were collected per site, each to a depth of 6 inches, which were then pooled. The soils were sieved to pass a 2 mm mesh, and 200 cm3 (approx. one cup) was mixed into the top 1/4 or so of the compost vermiculite mixture of a bag. Five bags were prepared for each soil source. In addition, one set of 5 bags received no soil (as a control), and another set of 20 bags received bahiagrass seedlings pre-colonized by one of four AM fungi (5 bags per AM fungus). Each bag received 5 bahiagrass plants. Inoculum production bags were sampled on November 15, 2016 after the bahiagrass had winter-killed. Roots were analyzed for percentage root length colonized by AM fungi. Samples of the compost and vermiculite mixture from three bags of each treatment/ soil source, as well as three samples of a mixture of the 4 inoculated AM fungus species, were utilized to conduct Most Probable Number [MPN] bioassays to determine the number of propagules of AM fungi per cm3 of mixture. Briefly, we conducted MPN assays by diluting one volume of inoculum with 9 equal volumes of a sterilized soil and sand based potting mixture to create a one-tenth dilution of the original. This was used to fill 5 small plant pots. A subsample of the one-tenth dilution mixture was again mixed with 9 volumes of sterilized mix to produce a one-hundredth dilution, and on through the one-ten-thousandth dilution, the goal being to dilute the original inoculum “to extinction” (that is, until AM fungi are no longer present). Each pot then received a bahiagrass seedling. Plants grew for 4 weeks, after which the entire root systems of each pot were collected and examined for colonization by AM fungi. They were scored simply plus / minus for presence or absence of colonization. Statistical tables were consulted to yield the most probable number of propagules of AM-fungi-per-cm3 of inoculum. Since results of MPN assays can show much variability from one replicate to another, the percentage root length colonized by AM fungi of roots in the one-hundredth dilution also was determined as a measure of the amount of viable AM fungi in that dilution. MPN bioassays also were conducted on the original soil samples at the time of collection in June. Farm habitat from which soil was collected for use as starter inoculum had a significant effect upon inoculum production. Soil from the soybean/wheat and corn/rye plots had significantly greater density of AM fungus propagules at the time of collection (June, 2016) than soil from the wooded fence row (Figure 3), the other sites being intermediate. 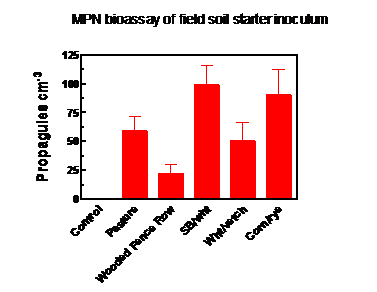 Colonization of bahiagrass roots within the inoculum production bags, sampled at the end of the growing season, was not significantly different among treatments, and ranged from 39% of root length in the non-inoculated controls to 54% in the soybean/wheat treatment. This indicated contamination of the control bags via either roots or soil mixed into the compost and/or colonization of the bahiagrass up from the soil, through the weed barrier fabric upon which the bags rested (see Figure 2). 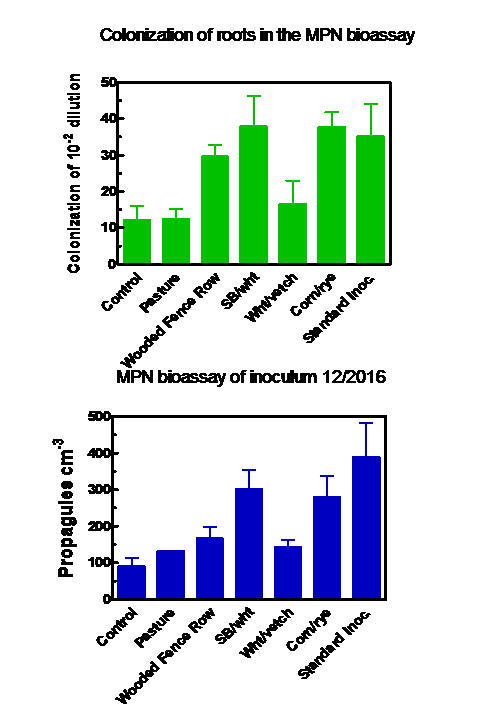 Quantifying the inoculum produced at the end of the growing season via the MPN bioassays produced similar results whether propagules or colonization of roots were measured (Figure 4). The best inoculum production occurred in the bags that received the pre-colonized seedlings (the “standard method”) or soil from the soybean/wheat or corn/rye fields. Soils from the pasture, wooded fence row, and the wheat/vetch plots produced inoculum levels that were not statistically different from those of the control. Though this, like all field experiments, should be repeated, the results indicate that soil collected in late spring/early summer from fields used to grow a row crop the previous year, followed by an overwintering cover crop of a cereal grain, serve as the best starter inoculum for the on-farm production of AM fungi. Figure 1. On-farm production of AM fungus inoculum. 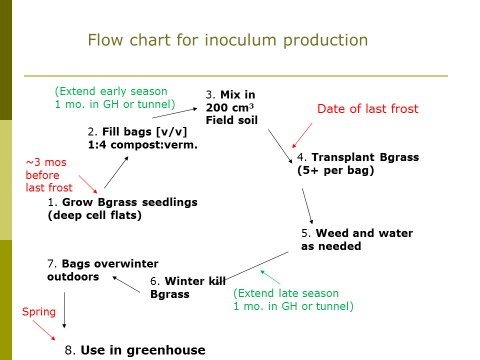 Follow the steps from 1 (sowing bahiagrass seeds 3 months prior to the average date of the last frost) through 8 (use of the inoculum the subsequent spring). Parenthetical suggestions, in green, are for locations with short growing seasons to ensure enough time for bahiagrass growth and AM fungus proliferation. Figure 2. On-farm inoculum production bags at the Rodale Institute showing growth of bahiagrass toward the end of the growing season. The bags rest on weed barrier fabric. Figure 3. Propagules of AM fungi per cm3 of field soil collected from 5 different locations on the Rodale Institute farm on June 15, 2016. Results of 3 MPN bioassays each. Figure 4. Percentage root length colonized by AM fungi in the one hundredth dilution (top panel) and total AM fungal propagules (bottom panel) present in the Most Probable Number bioassay conducted on the inoculum produced on farm. Means of 3 groups of 5 plants (top) or 3 MPN bioassays (bottom). David Douds is a research microbiologist at USDA Agricultural Research Service in Wyndmoor PA.
For questions about this material, please contact the author by emailing david.douds@ars.usda.gov. To read about early work on propagating indigenous AM fungi, and on the use of perlite and horticultural potting media as substitutes for vermiculite in the growth media in the bags, please see Douds, D.D., G. Nagahashi and P.R. Hepperly. 2010. Production of inoculum of indigenous AM fungi and options for diluents of compost for on-farm production of AM fungi. Bioresource Technology 101: 2326-2330.